Although these stones are very simple, they caught my eye because they dated back to 1797. I didn’t expect to find too much about this couple, but when I looked on Ancestry.com, the first thing I found were their names on passenger lists. I found Fred arriving in the United States on June 19, 1856, born in Hoth, coming from Bremen, Germany, and arriving in New York City on the ship named Dorette. 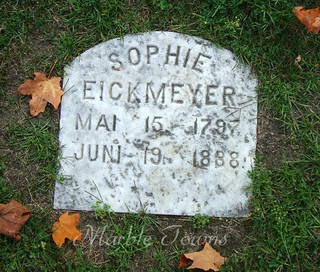 Sophia was with him, as she is also listed as arriving on that date, from Bremen. In all of the census data I found, they are living in Sheboygan (which is where this cemetery is), with both of them listed as having a birthplace of Prussia (a country which doesn’t exist today, as it was officially abolished in 1947). The 1860 census lists their children, Gottlieb (age 30 at that time) and Louisa, age 23. 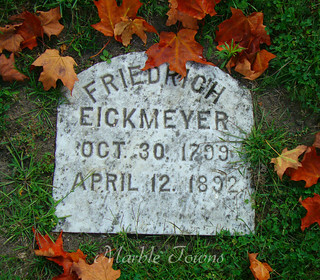 In 1860, Friedrich is listed as a cabinet maker, although his occupation changes in the 1870 census to being a farmer, and then in 1880, he is listed as a carpenter. The 1860 census shows Gottlieb as also being a cabinet maker, so I like to think that father and son created furniture together.